This stunning Amish Curio Cabinet will be admired by many. Position this solid wood display case in your dining room or entryway and enjoy the memories of your treasured collections. Skillfully curved to create an attractive presentation, this glass curio cabinet brightens the room. The detailed carving on the legs of this Amish cabinet displays the skill of Amish craftsmanship. Keep dust off of your prized keepsakes and display them for all to see versus storing them in the attic or garage. A solid wood curio cabinet like this Amish Cabinet provides room for special dishes and serving pieces as well. 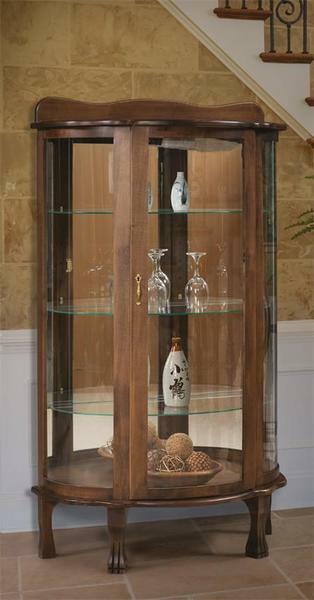 The mirror back of this Amish display case creates the look of a spacious cabinet. Three adjustable shelves with plate grooves provide display areas and there is a touch light that is built in to provide a warm glow. Amish furniture always offers customization options. Select wood shelves for this lighted curio cabinet or add additional shelves to create your own display. Explore our collection of Amish Hutches for other display options. Visit our popular blog post, "Curio Cabinet of Curiosities," to learn more about our Amish made curio cabinets.